I have been in my spot now for 2 and half years. That is crazy to think about. I have been meeting with all of our volunteers just to touch base with them since our junior high pastor will be transitioning out (I have an open JH spot on my team, if you’re interested, hit me up) and one of the leaders said something to me that really stood out to me as we were talking about the last few years. She said, “It’s like we have a whole new group of people and values.” It’s true. The atmosphere is way different now, intentionally so, and it’s been something we have been working towards all year-long. All year-long we have been striving to change the culture of our Wednesday nights to one of actively seeking Jesus, leaders who are bought in, and one of fun, and all of the things we have done are starting to pay off. Pray – Our team spent time in prayer together. We got together and dreamt and wrote down our values what we wanted to see in our ministries and we began by giving it up to God. Yes, people can change the culture to a point, but the type of change that we feel called to introduce to our students can’t come from us, we don’t have that power. Only Jesus does. Give it up to him. Observe – For the first 4-6 months I just observed. I took crazy detailed notes. I looked like a creeper in the back as I took notes and began to write down things that could/needed to be changed. From the tech, to stage and program, to volunteers, job descriptions etc. Everything was under the microscope. After months of seeing how our systems were set up and looking at what they were producing, we began to address them one by one. Apply slowly – At first there was just cosmetic stuff to make services flow better or look better. Stuff everyone wanted to get better right away. Everything we changed first were things we had the power to easily change. Graphics, social media, sermon illustrations, song choice, band and games we played. Changing the culture is not a “band-aide” mentality, you can’t just rip it off. People are biologically ingrained to resist change… so do it gracefully. After the services were we wanted and we found a good balance, then we moved to people. Volunteers – People are different from programs, we all know that. From the very beginning of me starting my position, I casted vision of where we want to be. Along the way, some people realized they were not on board, so they decided to get off. Others, not so easy and hard conversations followed. You can never repeat your vision enough. By the time you are tired of hearing your vision, your volunteers are just beginning to get it. Adjusting the vision of current volunteers can happen and when they get it, they go after it. Once we established who is in or not, we began seeking after new leaders with this new vision who all they know is the new ways and when they get it… they are bought in. Culture begins to leak from them to your students. Even down the line when you want to make more changes, the ones that are bought in will be your biggest advocates and will back you in the future because of how you first initially handled this first big change. Relationships – Now that we have these leaders with this vision of where we are going and they know what success looks like, we release them out on students. Volunteers who understand the vision of your ministry and know what success looks like are unstoppable forces in the name of Jesus. The events we did, the series we planned our summer camp we choose to go to all were intentionally relational in nature. This has established our core group of students and now we get to build with an incredible foundation moving forward as we begin to launch small groups and continue to reach students far from God in hopes to see them come close to God. I know there is a ton more we can all say when it comes to the culture of your group and I know the culture is different in every group. I do know and have experienced, if you don’t like the culture you can begin to prayerfully, slowly and change the culture you desire for your leaders and students to come to know Jesus in a way they have not been able to with the current culture that is in place. 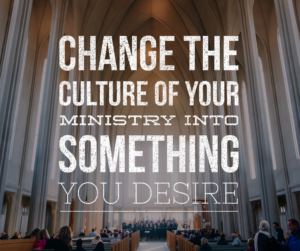 What did you do or have you done to begin to set the culture you have wanted to see in your own ministry?